My latest FO has been a long time coming. I started it back in October and finished it only a couple weeks ago. It was my only deadline knitting and I finished it right on the wire. 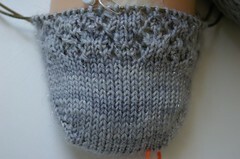 Back in October, the Sockamania pattern for the month was the Elegance sock pattern. It had beautiful cables on the sides and I thought that it would be a great sock for my mom. I picked a yarn that I thought she would like and started knitting. I finished the first sock on my trip to Iowa in November. I cast on for the second sock just before leaving for Switzerland in December. I really wanted to be able to give the pair to my mom for Christmas but I didn’t get to knit a whole lot while in Switzerland. 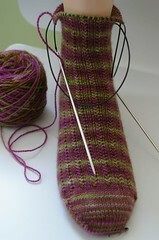 When I came back from Switzerland on December 19 I think I just had turned the heel and was just starting on the leg. 5 days to go till Christmas… I knit on the sock during every spare time and finished knitting the sock during our Christmas Eve party with my parents. I was able to weave in the ends, pick up some discarded wrapping paper, wrap it up and hand in to my mom right there and then. That was cutting it close! The next morning just before my parents were getting ready to leave to head back home I had my mom model her new socks for me. They fit her quite well although they are a bit tight to get around the heel. I think I need to get a looser gauge in that area for them to fit her better. I guess I’ll just have to knit her another pair! Christmas day, since I had just finished the Elegance socks I picked up my Charade pattern and cast on for the second sock. I’m almost done with the second sock and should have it done by the weekend. It will be nice to add a new pair to my sock drawer! I cast on last night for the Snowflake Lace socks out the Lotus Yarn Aura I purchased a couple months ago. I’m knitting them toe-up and have knitted the toe plus one repeat so far. You can’t really see the pattern quite well yet but I’m sure that after a few pattern repeats it will be nicer to look at. The silver strands of the Aura make the sock all shiny just like snow! The yarn is really soft and the silver doesn’t seem to be bothering me at all. I’ve also picked out the yarn to knit the January Sockamania pattern but I think that will wait until I get done with the Charade socks. Next time I’ll tell you about this really cool Sock Club I joined!